Sub : Availability of option for fixation of pay on promotion from the Date of Next Increment (DNI) in the lower post and method of fixation of pay from DNI, if opted for, in context of RS (RP) Rules, 2016-reg. Ref : (i) NFIR’s letter No. IV/NFIR/7th CPC (Imp)/2016/R.B.-Pt. I dated 06/01/2017. 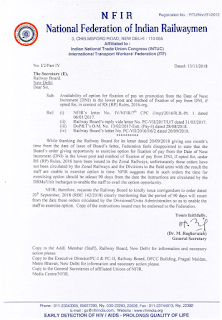 (ii) Railway Board’s reply vide letter No. PC-VII/2017/U/7 dated 31/03/2017. iii) DoP&T’s O.M. No. 13/02/2017-Estt. (Pay-I) dated 28/08/2018. (iv) Railway Board’s letter No. PC-VII/2016/I/6/2 dated 20/09/2018. 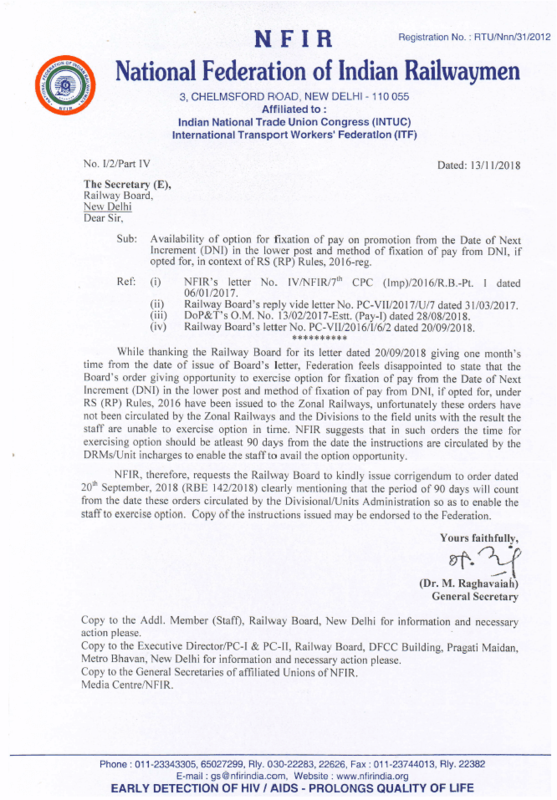 While thanking the Railway Board for its letter dated 20/09/2018 giving one month’s time from the date of issue of Board’s letter, Federation feels disappointed to state that the Board’s order giving opportunity to exercise option for fixation of pay from the Date of Next Increment (DNI) in the lower post and method of fixation of pay from DNI, if opted for, under RS (RP) Rules, 2016 have been issued to the Zonal Railways, unfortunately these orders have not been circulated by the Zonal Railways and the Divisions to the field units with the result the staff are unable to exercise option in time. NFIR suggests that in such orders the time for exercising option should be atleast 90 days from the date the instructions are circulated by the DRMs/Unit incharges to enable the staff to avail the option opportunity.